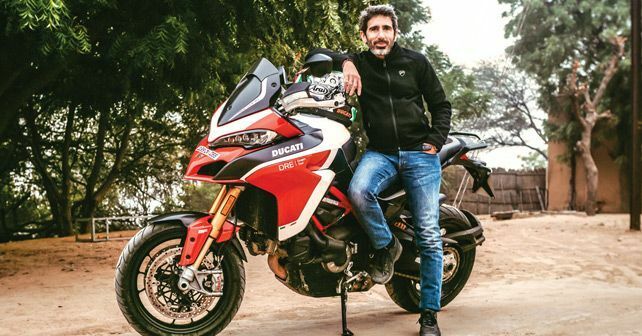 We catch up with Francesco Milicia – VP Global Sales, Ducati – on the side-lines of DRE Dream Tour to Rajasthan. What was it like riding a Ducati during this Dream Tour? It was lovely to be in a place as lovely as Rajasthan. We saw incredible things on the way… incredible animals, too. We had a great experience overall, and it was wonderful to ride along with Ducati owners here. Of course, India is not a very big market for high-end motorcycles, but we’re still doing really well. Although you were riding a Multistrada Pikes Peak, which Ducati bike you think is perfect for our road conditions? At the moment, I think the Scrambler 800. It’s light and agile. Even the Scrambler 1100 is great for these conditions. But, again, it depends. If you want to do long rides, the Multistrada is the one for you. Similarly, if you want to be the fastest on the track, you can take the Panigale, and if you want to look the coolest in town, the Diavel is for you. Is it true that only a limited number of bikes are allotted to the Indian market, especially bikes like the Panigale V4? Not really, it depends on the demand. But, of course, it takes time to produce a motorcycle, so turnaround time is higher. And the demand for the Panigale is high as ever – one out of every four superbikes sold in the world is a Panigale. Any plans to enter the sub-500cc segment in India and other developing markets? Ducati stands for performance. Our three core values are style, sophistication and performance, so this is what we focus on with our big bikes. But, of course, we’re looking into the smaller segment, but there are no immediate plans. Also, if that happens, the bike will have pure Ducati DNA, and we won’t rush in the development process – like some of our rivals have done.